Today I’m gonna talk about your first video and youtube and youtube video ideas for beginners. If you never upload a video till yet, think again. You can earn lots of money, Anyways this is not our today’s topic, we’ll discuss the importance of youtube in my later Article. Guys In this Article, I am suggesting you some best Screen recording software for creating youtube videos. Do you know? Every youtube uses a screen recorder software, Some very good software provides screen capturing and recording features like Filmora. But if you’re a beginner then you need simple software, too many features can create complications for you to understand and you’re a beginner. That’s because You need a targeted simple software to record a video and upload it, this is a mandatory thing. Video Editing, Monetizing all are secondary things and you can do this anytime. If you want to create a youtube video using any screen capturing software, Mostly users create video from an Android Smartphone and Windows PC. Download Screen Recording Free Top Rated Softwares for Windows and Android. Creating and uploading a youtube video is difficult, Really Do you think like that? Some people have the talent to create Quality videos, but they’re not uploading any video on youtube because it seems to be difficult. If you still think like that, trust me you can create youtube video very easily. If you never upload a youtube video, listen to my words carefully maybe it will change your views towards uploading a video. Think about to record a crafted video, or If you have knowledge about any Interesting topic, Share your knowledge on your niche by creating video and earn lots of money. I like to give you my example: I also thought that first I need to create a video and upload on youtube is slightly difficult but last week. When I was checking videos on youtube, I saw some bad quality and fake youtube videos get thousand, millions of views and then I decided to create a youtube video and trust me guys I have created 2 videos from screen recording software. My 1st video is created from Smartphone and 2nd video is created from windows PC and you can get the both two software’s information and downloadable link between the post. Back to the story, I was created and uploaded 2 videos, but I heard about i need to create a channel, cover photo, add social profiles and so on. All these things are important but the 1st most important thing is to upload your 1st video on youtube because this platform is very good if started as early as possible. I’ll feel honored myself if my story will become an inspiration for you to create and upload your first youtube video. Inspiration why? Let me tell you, Techsable channel has 4 videos All 3 got 2k views but the last one got 17k views, no sharing, no promotions nothing but still my channel is running and whenever I get time I will upload a video on youtube. How simple is that, because I make it simple. Just upload your first video, your 75% doubts will automatically clear. I will provide you with deep information about every youtube element set up in my next Article. I have used 2 different software for screen recording, one for Android and one for Windows. Both Softwares are Free, Easy to use, Provides Elegant design, great user interface, and the best part is both of two’s software are top rated and tested for beginners. You Don’t need to waste time searching because I know Time is precious, that’s why I am here for you. If you’re looking for something like this, Try these free software and I think this will help in creating youtube videos. 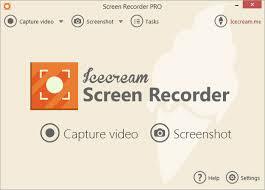 Icecream Screen Recorder is an application for screen capture and taking screenshots. Icecream Screen Recorder can both take screenshots and capture video and you can even switch between these 2 modes very easily. Just press the button in the top left corner of the application. One thing is confirmed that you can create a video by this screen recording software with ease. Whenever you want to create a youtube video by screen recording software, just try this top rated software for beginners and at the same time, it’s completely free. ★ Video can be taken with or without system sounds and microphone sounds. ★ Desktop icons could be shown or hidden. Users can use default hotkeys or create their own hotkeys combinations. ★ The size of the area to be captured can be selected manually or users can choose one of the preset resolutions offered by the application. ★ It is possible to add graphic elements like arrow, circle, rectangle, random lines and text of different colors and thickness right to the working area of the application. ★ Recorded video can be paused and resumed at any second interval. Screenshots can be saved as image files to your PC’s hard drive. Clipboard or you can even send them to Icecream Apps server and uploaded online for simple sharing. AZ Screen Recorder is the best Screen Recording application in android also it’s completely free. With this app you can record screen capture screenshots, and also this application provides some unique features. ★ Magic button: a button that controls your recording without showing anything on the screen. Thus, your video viewers will solely focus on the app, the game or whatever you want to screencast. ★ Overlay front camera: you can record your face and your emotions in a small overlay window, which can be dragged freely to any position on the screen and customized to any size and opacity. ★ Countdown timer: is there something you have to prepare before recording? Don’t worry, the countdown timer will wait until you are ready to start and snap at the moment you want. ★ Draw on the screen: this unique feature is huge when making a tutorial. You can emphasize, draw a symbol or mark something with any chosen color directly on your screen. ★ Trim videos: the screencast can be long and contains unnecessary information, you can trim the parts you don’t want to make your videos even more impressive. If you want to earn massive income from youtube, you only need to do is to create a simple video and upload and all the rest of the thing we’ll do for you. In our next article, we’ll discuss creating a channel, monetizing and how you can setup youtube account.